Summer days at San Diego County parks can now drift into summer nights with the many nighttime programs offered by the Department of Parks and Recreation. Daring explorers can go on one of the night hikes which will be offered during the month of August. Grab your warmest outdoors clothes and plenty of water and hit the trails! The first of these hikes will be at the Kanaka Flat Loop at the Santa Ysabel County Preserve on August 5. Hikers will have the chance to learn about the history, flora and fauna of the area and walk the seven-mile loop under the moonlight. The hike begins at 6:15 p.m. at the preserve’s staging areas. The second night hike will be held at Poway’s Sycamore Canyon-Goodan Ranch Preserve on August 26. Hikers will have an opportunity to learn about the animals who call this preserve their home, such as bats, snakes and coyotes. This kid-friendly hike has limited spaces. Park authorities recommend making a reservation at (858) 513-4737 to save your place. Hikers will meet at the Goodan Staging Area, located at 16281 Sycamore Canyon Road, Poway. Those who prefer to relax under the stars instead of hiking beneath them can check out one of the star parties which will be held in the coming weeks. On July 21, visitors are invited to the Sycamore Canyon-Goodan Ranch Preserve to watch the stars through the same technology used by professionals. This star party will be held at the Highway 67 Staging Area in Lakeside. The event will be cancelled in case of cloud cover or rain. On August 12, a night of stargazing will be held at Lakeside’s Oakoasis County Preserve. The gathering organized by the San Diego Astronomy Association and Parks staff will begin at 7 p.m. and will also include a hike at twilight to look for bats and scorpions. Reservations can be made by calling 858-565-3600. The Summer Movies in the Park is making a return this year. Enjoy an evening with your family at one of the 22 participating parks around the county. Movies begin 15 minutes after sunset. Family-friendly films such as “Moana”, “Lego Batman”, and “The Sandlot” will be a couple of the many films projected. 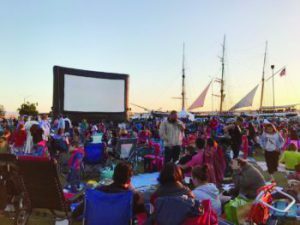 Classics such as “Grease”, “The Wizard of Oz”, and “E.T.” will also feature among the many movies to be played at parks in the coming months. 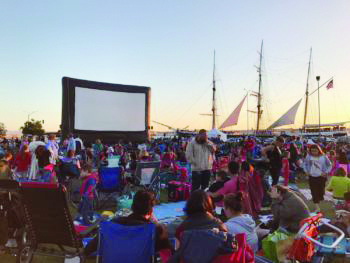 Many screening locations will feature activities, live music, and food trucks before screentime.